A few months back, a new restaurant was getting ready to open doors in our neighborhood. I walked by, and loved the decor – contemporary country with an eclectic flair. Couldn’t wait until we finally had a casually elegant place, hopefully with good food, nearby. I checked their menu. It looked very promising. One thing immediately caught my attention – Pork Chop Stuffed with Pears and Goat Cheese. For a carnivore, who loves experimenting it sounded like the perfect combination of savory, sweet and tangy. I was looking forward to trying it. Weeks passed and the restaurant was still not ready to open. Waiting for city permits, they told me. My mouth was watering every time I thought of that pork chop. I couldn’t wait anymore. It was prime pear season, after all. I did some research online hoping to find a recipe for pork chops with pears and goat cheese that I could make at home. No luck. Millions of recipes for pork chops and none with those ingredients. Well, here I had it. A perfect opportunity and an inspiration to develop my very first original recipe. The meat, cheese and pears were going to provide the texture and the sweet and savory taste. I was planning to add onions, as I do with almost every meal I cook. But I needed some distinct aromas to complete the sensory experience. Cumin goes really well with pork and I wanted to see what adding coriander would do. A brief search on some flavor pairing sources also suggested rosemary. Hmm! That may be that last touch of fragrant freshness that I was looking for. About an hour later and a tablespoon of balsamic reduction on top, I couldn’t believe that the first attempt delivered such a delicious creation. It turned out great! I have made these pork chops on multiple occasions since, tweaking here and there every time, and they are always very well received by family and company. In fact, when I made the recipe for this post, Aaron couldn’t resist and had two big pork chops in one sitting. When the restaurant finally opened, I was disappointed to discover that the item was not on the menu. I wonder why. So, for now, mine is the best Pork Chop with Pears and Goat Cheese I have ever had. Thank you, Mack & Kate’s, for the great idea! I’d love to know what inspires you in the kitchen. Have you developed your own recipes? What was the most successful? What was the biggest disappointment? The total time needed to prepare this recipe is a little over an hour. If you have more time, I will recommend letting the pork chops sit in milk for a couple of hours. The milk is a great tenderizer. On the side opposite of the bone, cut a horizontal opening in each pork chop to create a pocket for the stuffing. The bone should serve as the bottom of the pocket. Mix coriander, cumin, black pepper and ½ teaspoon of the salt. Rub the pork chops inside and out with spice mix and set aside. Start balsamic reduction: mix vinegar, shallot and brown sugar in a small saucepan and place on medium heat. After it starts boiling, turn heat down to medium-low and let simmer until content is reduced to 1/3 of the original amount. Sauté onion. Core pears and cut in small cubes. Mix sautéed onions, pears and soft goat cheese in a medium bowl. Add finely cut rosemary and a pinch of salt. Use a spoon to stuff pork chops generously with goat cheese and pears mix. Lightly roll stuffed pork chops in bread crumbs. Make sure bread crumbs cover the pocket opening to prevent stuffing from coming out. Brown pork chops on medium heat on both sides. Arrange in a greased baking pan. Roast for 30-40 min. or until thermometer placed in the middle of a pork chop reaches 160°F. Sprinkle each pork chop with one tablespoon balsamic reduction. Serve with white rice. ©The recipe and pictures in this post are copyright of the author. This entry was posted in Holidays, Main Dishes and tagged Balsamic reduction, Coriander, Cumin, Easy pork chop, Goat cheese, Pears, Pork chops, Recipe, Rosemary. Bookmark the permalink. What a great looking chop! 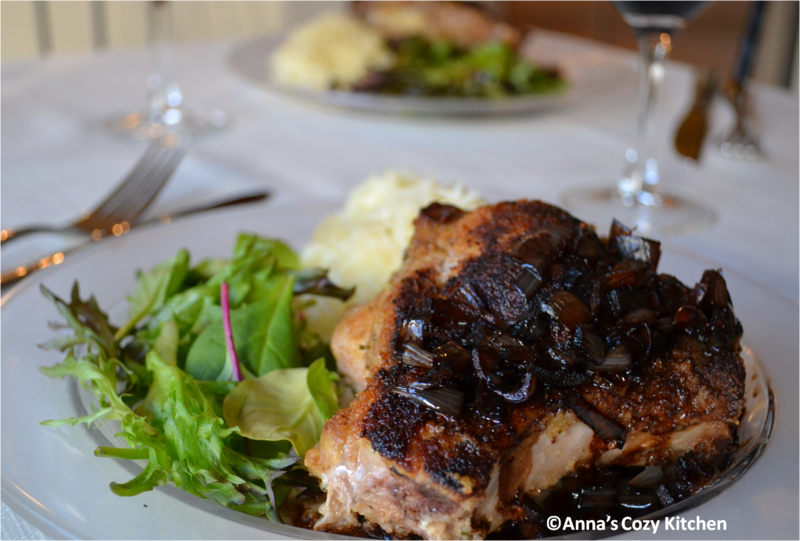 Can’t wait to try this..
Anna has served this recipe to us when we were her guests. The pork chops were delicious. We highly recommend this recipe. We especially liked the texture and taste of the goat cheese. Eating this cheesed inspired my husband to try it on his bagel instead of cream cheese — a success. Bagels with goat cheese and blackberry jam from the Loveless cafe. Yummm! I have not tried this yet but it sounds delicious – pears and goat cheese is a great combination. Love goat cheese! I love goat chese too. There will be more stuff with goat cheese on this blog, but you should have your mom make these. They are great! I followed you from the foodieblogroll and I’d love to guide Foodista readers to your site. I hope you could add this pork chop widget at the end of this post so we could add you in our list of food bloggers who blogged about recipes for pork chops,Thanks! I made this last night for my family and it was delicious! Pears, goat cheese with the balsamic reduction… oh yummy!!! This recipe was super easy!! Next time I will make sure to create the largest possible pocket inside the pork chop so lots of the filling will fit inside. I may even try this on chicken as my pork chops always end up a bit on the dry side. Thank you for this recipe!! 5 stars!! Thank you! This is one of the first recipes I created myself from scratch and I am very proud of it. One of my husband’s favorites too. As for the dryness of the pork chops, they actually don’t require too much time to cook. You may need to experiment with your oven, but don’t leave them much past they reach 160 degrees.